Leap Year’s day, Thursday 29th February 1912, saw a collapse of the towpath bank almost opposite the dock and wharf at Kerridge. 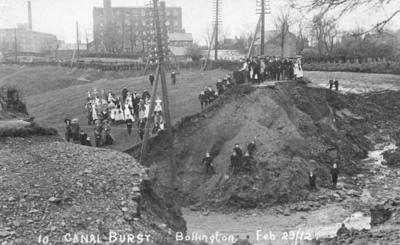 The breach, known locally as the ‘Bollington Burst’, is believed to have happened at 1 o’clock in the night and the whole length from Whaley Bridge and Bugsworth all the way to Bosley top lock is reported to have drained away, the bridges not being stopped until 8 o’clock in the morning. By great good fortune an early photographer took a series of very good pictures enabling us to take a close look at the canal and the breach, and also some of the steps taken to repair the hole. The picture (right) shows the breach from the south. In the background from left to right are Adelphi mill, Beehive mill and the Bobbin mill (low building between three poles). Neither of the latter two still exist having been demolished many decades ago. It seems probable that a culvert beneath the canal at this point was responsible by virtue of its collapse. Malcolm Bower, Secretary of Macclesfield Canal Society , notes that “When the culvert was examined a few years ago, the contractors told me there were signs in the culvert bricks or stones of where it had been rebuilt.” It is interesting to note that the towpath edge was not walled at this point even though much of the bank from bridge 28 was so protected. However, it is unlikely that this lack of protection had any material affect on the incident. The culvert carries the Tinkers brook under the canal and all the water went with it into Tinkers Clough. Today the clough is a haven of peace and quiet, a damp wooded area in a deep valley providing a home for a wide variety of flora and fauna. It is publicly accessible from the towpath end of bridge 28 and from Clough Bank, which is off Grimshaw Lane, Bollington. It has been the subject of an environment project in recent years and provides a very pleasant walk through the wood and valley. 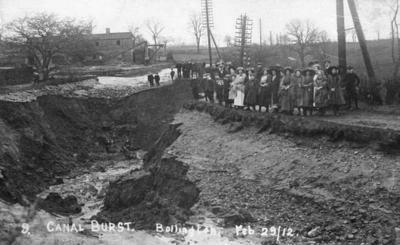 It is clear from one of our pictures that the clough was heavily wooded in 1912, so there can be little doubt that the rapid inflow of water and its depth would have caused considerable damage. This huge flow might well have gone through West Bollington, the area at the bottom of Grimshaw Lane, Henshall Road and Wellington Road, causing enormous damage and with risk to life and limb. However, one piece of good fortune meant that the inhabitants suffered little more than wet feet. This was the fact that the clough had been filled in at its lower end by the construction of the railway in 1869. Beneath this infill there was another culvert leading a good 200m to a point behind the properties on the west side of Henshall Road. This small culvert would certainly have slowed down the escape of water from the clough. Though the railway at this point was at a lower level than the water in the full canal, it is not known whether it overtopped the infill and crossed the railway yard, or ran down the railway to the low point on a bridge over Grimshaw Lane. There are no pictures or press reports showing any evidence of this. It seems probable that the initial surge was contained by Tinkers Clough and that the culvert was capable of discharging the slower flow that would occur after a few minutes. 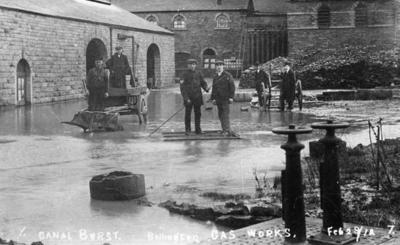 There are pictures showing flooding in the streets at West Bollington (above) and at the Bollington Urban District Council Gas Works (right) which was beside and below the railway (where Spinners Way is today). We think this was flooded because the culvert under the railway originally resurfaced somewhere on this site. When the gas works was built the stream would have been in the way of the excavation and an extension to the culvert was constructed but at a lower level. There is a manhole where this drop occurs. There is every probability that the top blew off and water surged out to flood the gas works. It is said that the furnaces were extinguished by the flood. The Manchester Guardian reported on 1st March that the flood had put out the fires at the gas works and flooded the pipes directing the gas from the holder, thus cutting off the supply to the town. This resulted in interruptions to production at Adelphi and other mills where gas burners were used to burn off the whiskers from the cotton thread. The water finally escaped down Albert Road (left), and in such volumes that the pavement was torn up and wrecked in parts. Serious damage was reported at Lowerhouse mill and at Waterhouse mill along Wellington Road. Picture (right) shows how the repair might have been carried out. This is taken from the top of bridge 28 looking down on the north side of the bridge. It shows a group of boats, presumably held up by the stoppage. It also shows that a boat is under the bridge. This means that the water is being held up by something other than the bridge stop planks, which cannot be used if a boat is standing in that position. Why would they want a boat there? The reason is visible beside the boat – tracks laid for a tramway come through the bridge and extend a few yards on a frame which would have been in the water (no doubt similar on the south side until the tramway could regain the towpath), all this to provide a quay side through the bridge hole for the purpose of unloading fill into tramway trucks which would then have been pushed along the towpath and emptied into the breach. What a pity that the picture looking south (bottom) from the bridge does not show the tramway. In fact another picture shows tramway tracks in the field below the canal bank so it is possible they weren’t, at first anyway, laid along the towpath. One picture shows an upturned tramway hopper (right) in the field below the canal and another (below) shows tramway rails, including points, nearby with a horse harnessed up for pulling hoppers. 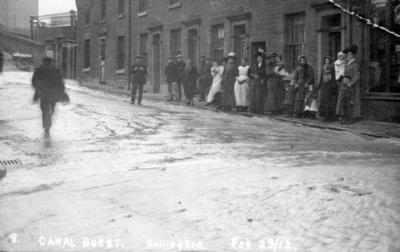 It looks as though the pictures were mostly taken on Sunday (3rd March 1912). This is because large numbers of people have turned out to look at the incident and most are in their best clothes! Only on a Sunday would they be dressed like that, and have had the time to visit. This picture (left) taken from the top of bridge 28 looking south shows the buildings surrounding the dock at Kerridge. 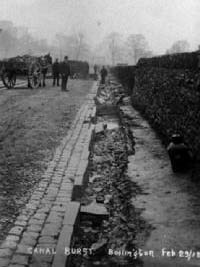 It also shows that the towpath bank had no wash wall at this point. 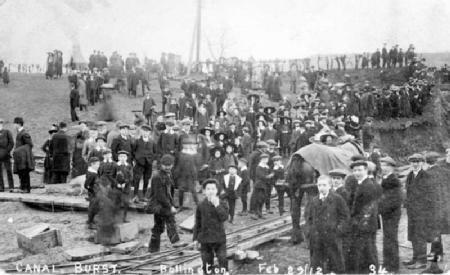 The canal was planned to be closed for just 10 days, but in the event it took about 3 weeks to repair the damage; 100 men were employed to shift the fill into the hole. About 160 boat loads of clay puddle and other fill were brought from New Mills. 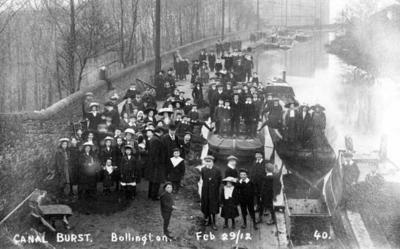 The full collection of pictures relating to this event can be seen at Bollington Photo Archive . (On the Bollington Photo Archive page, hover over ‘Subjects’, click on ‘Landscape’, then select ‘Canal burst’). 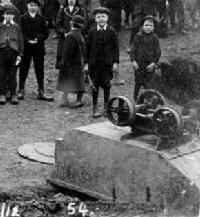 He also mentioned a relative having a picture of this event; however, there is none in the Discovery Centre collection.